How does fasting affect brain function? There is very little reliable human data, but some very interesting animal data, as recently reviewed. There are many potential benefits. While I tend to focus on weight loss and type 2 diabetes, there are many other benefits, including autophagy (a cellular cleansing process), lipolysis (fat burning), anti aging effects and anti-seizure effects. From an evolutionary standpoint, we can look at other mammals for some clues. In many mammals, the body responds to severe caloric deprivation with a reduction in the size of all organs with two prominent exceptions – the brain and the male testicles. This suggests that cognitive function is highly preserved. This makes quite a lot of sense from an evolutionary standpoint. Suppose you had some trouble finding food. If your brain started to slow down, well, the mental fog would make it that much harder to find food. Our brainpower, one of the main advantages we have in the natural world, would be squandered. No, the brain maintains or even boosts its abilities. In stories of Japanese prisoners of war in World War II (Unbroken by Laura Hillenbrand), many have described the amazing clarity of thought that often accompanies starvation. The preservation of the size of the testicles is also a significant advantage in trying to pass on our genes to the next generation. In all mammals, one of the highly preserved behavioural traits is that mental activity increases when hungry and decreases with satiation. Of course, we have all experienced this. Sometimes this is called ‘food coma’. Think about that large Thanksgiving turkey and pumpkin pie. After that huge meal, are we mentally sharp as a tack? or dull as a concrete block? How about he opposite? Think about a time that you were really hungry. Were you tired and slothful? I doubt it. Your senses were probably hyper-alert and you were mentally sharp as a needle. That is to say that there is likely a large survival advantage to animals that are cognitively sharp, as well as physically agile during times of food scarcity. Studies have also proven that mental acuity does not decrease with fasting. One study compared cognitive tasks at baseline and after a 24 hour fast. None of the tasks – including sustained attention, attentional focus, simple reaction time or immediate memory were found to be impaired. Another double-blinded study of a 2-day ‘almost total’ caloric deprivation found no detrimental effect even after repeatedly testing cognitive performance, activity, sleep and mood. What we say we are ‘hungry’ for something (hungry for power, hungry for attention), does it mean we are slothful and dull? No, it means that we are hyper-vigilant and energetic. So, fasting and hunger clearly activate us towards our goal. People always worry that fasting will dull their senses, but in fact, it has the opposite, energizing effect. These sorts of tests are easy to see in animal studies. Aging rats were started on intermittent fasting regimens are markedly improved their scores of motor coordination and cognitive tests. 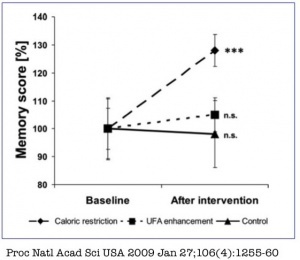 Learning and memory scores also improved after IF. Interestingly, there was increased brain connectivity and new neuron growth from stem cells. 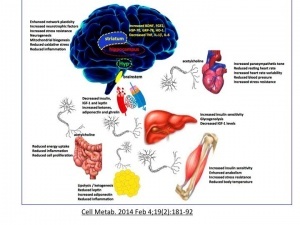 This is believed to be mediated in part by BDNF (Brain Derived Neurotrophic Factor). In animal models, both exercise and fasting significantly increase BDNF expression in several parts of the brain. BDNF signaling also plays a role in appetite, activity, glucose metabolism and autonomic control of the cardiovascular and gastrointestinal systems. There are also very interesting mouse models of neuro-degenerative diseases. Mice maintained on IF, compared to normal mice, showed less age related deterioration of neurons and less symptoms in models of Alzheimers disease, Parksinon’s and Huntington’s disease. In humans, the benefits to the brain can be found both during fasting and during caloric restriction (CR). During exercise and CR, there is increased synaptic and electrical activity in the brain. In a study of 50 normal elderly subjects, memory test improved significantly with a 3 months of CR (30% reduction in calories). Neurogenesis is the process where neural stem cells differentiate into neurons that are able to grow and form synapses with other neurons. Both exercise and CR seem to increase neurogenesis via pathways including BDNF. 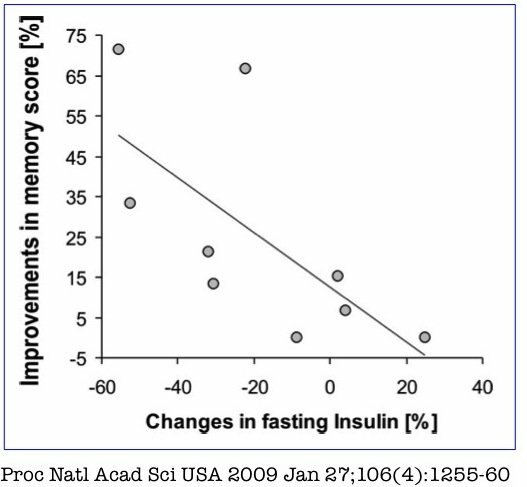 Even more interestingly, the level of fasting insulin seems to have a direct inverse correlation to memory as well. 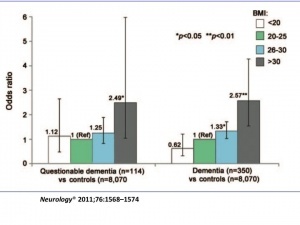 That is, the lower you are able to drive down fasting insulin, the more improvement on memory score that is seen. Increased body fat (as measured by BMI) has also been linked to decline in mental abilities. Using detailed measurements of blood flow to the brain, researchers linked a higher BMI to decreased blood flow to those areas of the brain involved in attention, reasoning, and higher function. Intermittent fasting provides one method of decreasing insulin, while also decreasing caloric intake. Alzheimer’s disease (AD) is characterized by the abnormal accumulation of proteins. There are 2 main classes – amyloid plaques and neurofibrillary tangles (tau protein). The symptoms of AD correlate closely with the accumulation of these plaques and tangles. It is believed that these abnormal proteins destroy the synaptic connections in the memory and cognition areas of the brain. Certain proteins (HSP-70) act to prevent damage and misfolding of the tau and amyloid proteins. In mouse models, alternate daily fasting increased the levels of HSP-70. Autophagy removes these tau and amyloid protein when they are damaged beyond repair. This process, too, is stimulated by fasting. There is substantial evidence that risk of AD is related to obesity. A recent population based twin study demonstrated that weight gain in middle age predisposes to AD. Taken together, this suggests a fascinating possibility in the prevention of Alzheimer’s disease. Over 5 million American have AD and this number will likely increase rapidly due to the aging population. AD creates significant burdens upon families that are forced to care for their afflicted members. Certainly fasting may have significant benefits in reducing weight, type 2 diabetes along with its complications – eye damage, kidney disease, nerve damage, heart attacks, strokes, cancer. However, the possibility also exists that it may prevent the development of Alzheimer’s disease as well. The method of protection may also have to do with autophagy – a cellular self cleansing process that may help removed damaged proteins from the body and brain. Since AD may result from the abnormal accumulation of Tau protein or amyloid protein, fasting may provide a unique opportunity to rid the body of these abnormal proteins. We will cover autophagy next week. How low carb do you go as a general rule: are you keto? I myself didn’t eat breakfast and I was attention deficit. Skipping breakfast isn’t helpful. Skipping launch, stopping eating at late night and having breakfast early in morning (without simple sugars) are better tips. Samuel, thank you for sharing your experience. Please share more specifically about your fast. Was it water only, broth, herbal teas, etc.? Scroll down until you see the chart. I don’t know why this posted before I was done. See clarified post below. @BobM thank you! Those are some really great things to think about. I hadn’t considered a protocol like that, so it gives me some ways I could mix it up on my own. Is headache “stress on the brain”? Is it wrong to think there is a time of “switching fuels” from sugar to ketones in the brain? i.e. at that point in time when Alzheimer’s patients become lucid on ketones? Hi Bob, I’m hearing you with the water coming out during a fast. After years of T2D UTIs and the like, it feels fantastic! The most enjoyable passing of fluid. I find this also happens when I enter/re-enter Ketosis. Dr Fung and Megan…just received my two copies of the Obesity Code Book: one for me and one for local and supportive Korean MD. helping me. My quick scan during my break today suggest that the book was well worth the wait! Many thanks again for all you do! I just got done devouring the book “The Everything Guide to Nootropics” by Evan Brand (Dr.? I’m not sure–he’s an NPT and CPT, and I don’t know what those initials stand for). After reading your article above, I wonder if it’s any use delving into the world of nootropics for brain improvement–it seems fasting does the same stuff (or almost the same stuff) as drugs/supplements, or even the brain-healthy food nutrients. Am I right? Sixteen pounds down since November 2015. Feels like an invisible little micro robot is going around to every cell in my body, with a pin, sticking it into each and every one and deflating them. As the old commercial for Alka-Seltzer use to sing: “Pop, pop, fizz, fizz, oh what a relief it is!! !” Have reduced portions; can’t eat as much as before. Have had to throw spoiled food out, as I did not get around to using it. Am now buying less food, saving a LOT of money! Pop! Pop! Fizz, fizz. Oh! what a RELIEF. IT. IS!! jcm, what is your fasting protocol – alternate days, multi-days, missing a meal? Do you have much to lose? Thanks in anticipation. Fizzy water with a slice of lime and sprinklings of sea salt. I know Dr Mosley does 6:1 (fasting 1 day) as weight maintenance. I believe you will get better results if you fast for a little longer. It was a blessing watching your youtube episode about reversing T2D. I am really motivated and encouraged to follow your regiment. Please let me how to start. Hi Dr Fung, I am presently doing a 3 week fast in a wellness center in Germany. I am thin and fit but suffer from Restless Legs Syndrome. I saw a documentary about fasting last year where the benefits to Parkinson’s were mentioned and since the medication I take for my RLS is the same as for Parkinson’s I thought it is worth the try. I started week 2 yesterday and feel good. They use the Buchinger method. Curious to hear about any information on fasting’s affect on healing traumatic brain injury. Thank you. I’m more interested to know the effects of fasting on early-onset Alzheimer’s, which has a larger genetic correlation than late-onset. There has definitely been an association with diabetes and late-onset and overall Alzheimers, but I found this study that says there is not one between early-onset and diabetes: https://www.ncbi.nlm.nih.gov/pubmed/28503814. I have read an anecdote of a woman who reversed signs of cognitive defecit by changing her diet to more paleo/HFLS, but there needs to be more evidence before we start touting diet change as a preventative treatment.